While peanut butter dates back to the Aztecs, we really have Dr. John Harvey Kellogg (of the cereal fame) to thank for introducing it to the masses. He patented the process of turning raw peanuts into a paste that was presented as a protein substitute for patients without teeth. 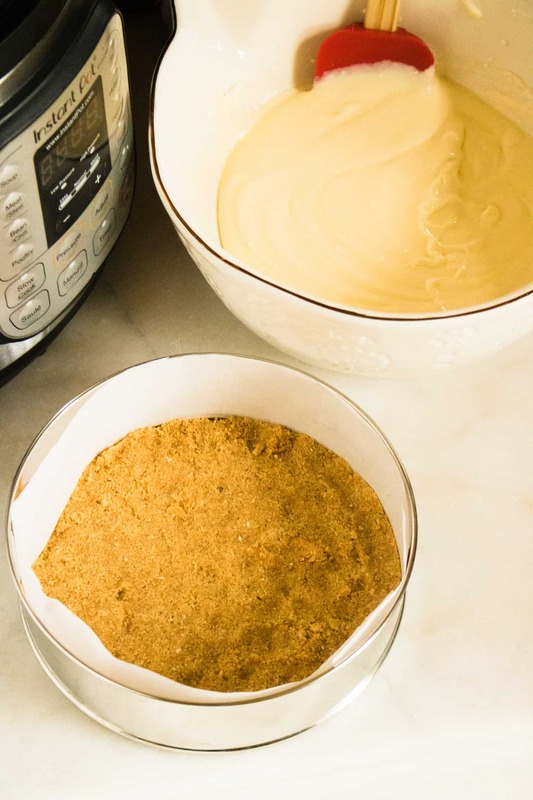 This recipe for Instant Pot Peanut Butter Cheesecake brings together smooth, velvety cheesecake with our childhood friend, peanut butter. Cheesecakes are fantastic at taking on familiar flavors and transforming them into something new and interesting. 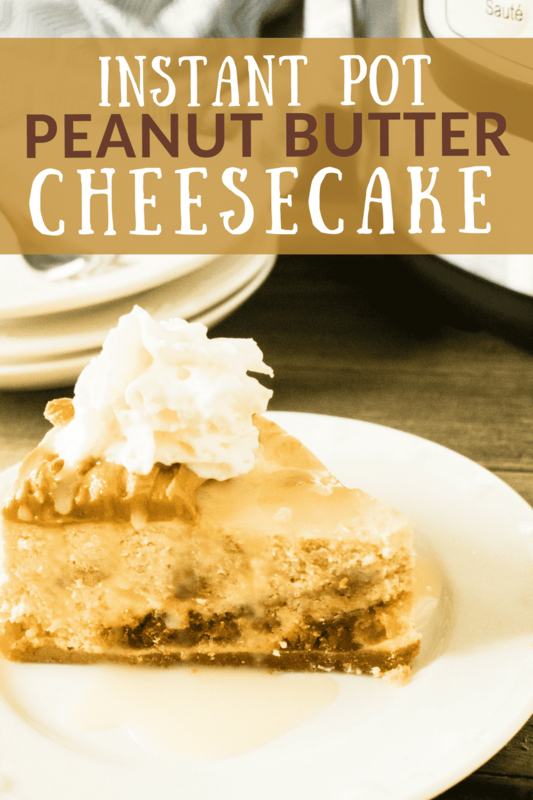 This Instant Pot Peanut Butter Cheesecake gives you two ways to add in delectable peanut butter flavor. If you want a more traditional cheesecake, you can mix the peanut butter right in with the cheesecake batter. If you’re feeling a little more artistic, and want to bring out a showstopper, you can swirl the peanut butter into the batter. This option gives a beautifully-presented cheesecake that is sure to wow your friends and family. 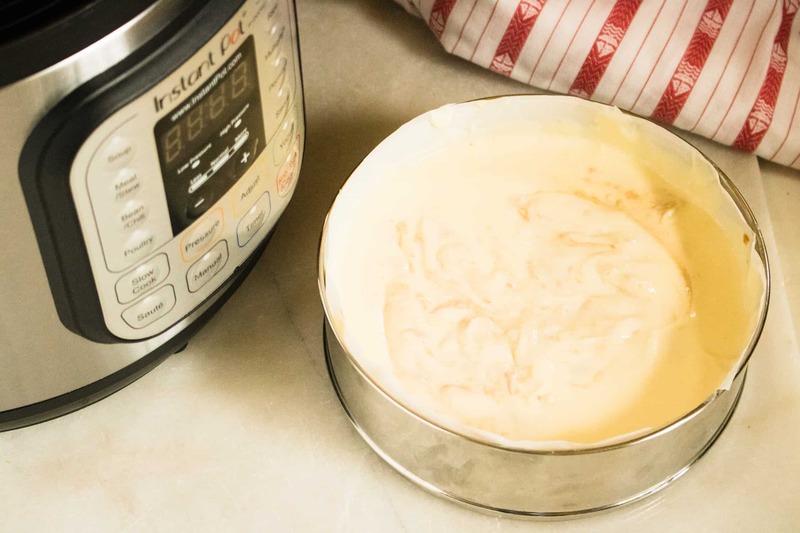 Ever since it made its market debut, cooks have been raving about making cheesecake in the Instant Pot. And it remains at the top of the list of popular Instant Pot recipes, because of the steamy pressure cooking environment that creates such an amazingly smooth and creamy cheesecake. Plus, it is so much faster! Traditional cheesecake recipes require over an hour of baking time, while this Instant Pot cheesecake recipe cooks in just 35 minutes (plus another 12 minutes of natural release time). 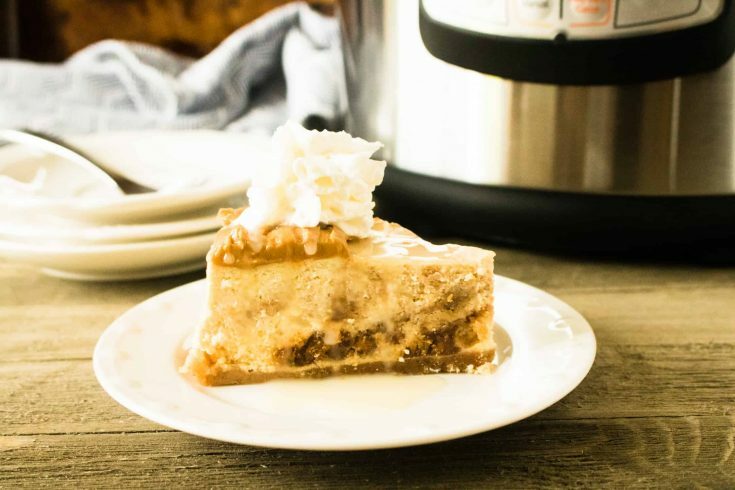 If you’re a fan of Instant Pot cheesecake, check out this round-up of 15 Instant Pot Cheesecake Recipes – The Best Cheesecake Recipes. Why not challenge yourself to try them all? And, this Instant Pot Oreo Cheesecake recipe combines delectable cheesecake with another one of our childhood favorites, Oreo cookies! When you’re craving the taste of cheesecake but don’t want the fuss (or the leftovers), this recipe for No-Bake Chocolate Cheesecake for Two is the perfect solution. Mix in the peanut butter, OR set it aside to swirl into the cheesecake. Pour mixture into the springform pan on top of the graham cracker crust. 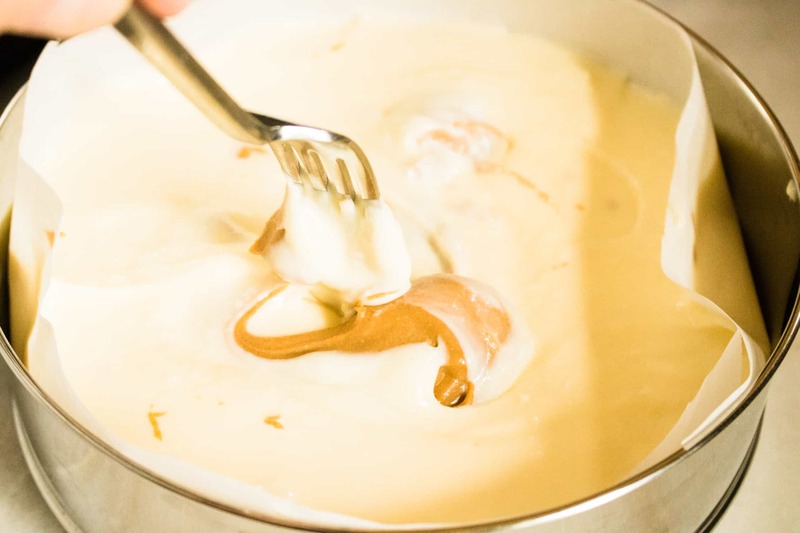 Now, swirl the peanut butter into the cheesecake (if you decided to use this method). Run a fork back and forth through the cheesecake several times to remove any air bubbles. Cover with foil. Pour two cups of water into the inner pot of the Instant Pot. Tear off about 2 feet of foil and lay on a flat surface. Lift the side closest to you, fold it up one-third of the way, and then press down. Fold the top section over the folded area and press down to make it flat. Place your pan in the center of the foil strip, and bring the ends up around the sides of the pan. While keeping your thumbs on the sides of the pan (to prevent tipping), hold the ends of the sling and lower the pan into the Instant Pot. 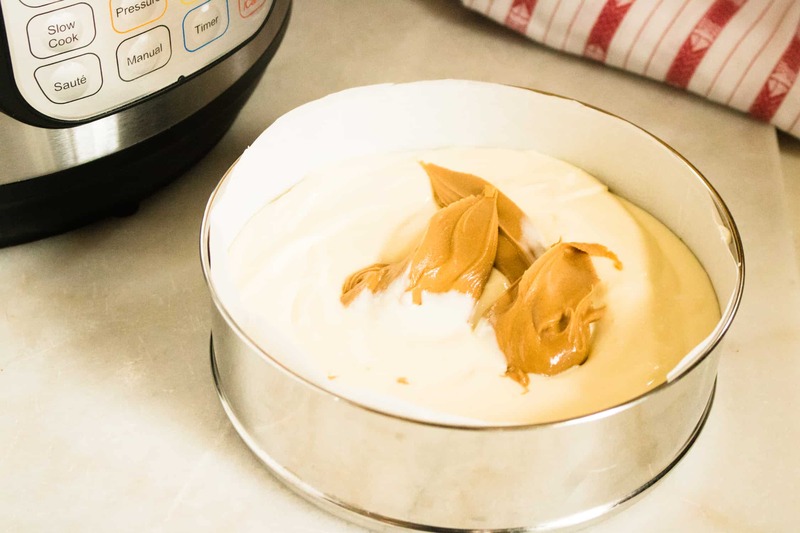 Enjoy a delectable taste of childhood with this easy and foolproof Instant Pot Peanut Butter Cheesecake recipe. Swirl the peanut butter into the cheesecake, if not already mixed in.